This is our second episode on the path of America entering the war and last episode we covered some of the actions of the American government before 1917 and then discussed the Zimmermann telegram in depth. Today we will take up our story from that point. Our two big topics for today will be how the United States went from neutrality in February 1917 to declaring war on April 6th then we will discuss the state of the country when war was declared. Before we even begin this discussion, I want to point out that the America of 1917 and the America of today are extremely different things. The 2017 version of the United States military is the most powerful in the world, and that power can be projected anywhere around the globe, that was absolutely not the case, the United States army barely existed. This meant that going to war was not as simple as sending an army overseas, they had to create the army in the first place. That is what makes the story of 1917 from April to the end of the year so interesting, at least to me. In early February 1917 the United States government had two new factors in its decision making process. 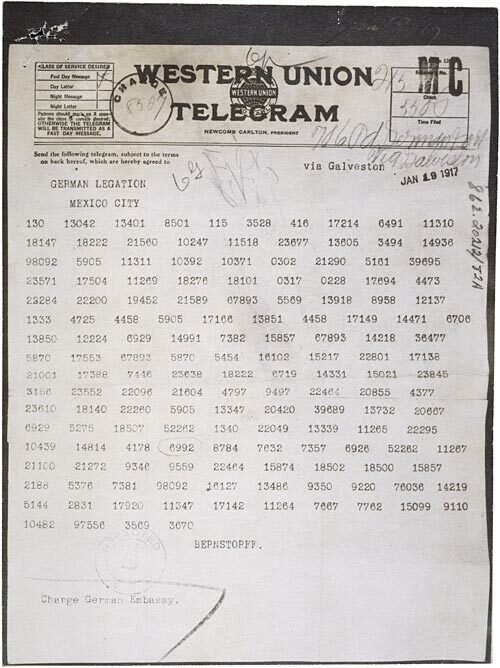 The Zimmermann telegram and the unrestricted submarine warfare campaign. At the head of the government was President Wilson and he seems to have not known precisely what he was going to do about these two new events. This went on for a few weeks until February 3 when it was decided to break off diplomatic relations with Germany. This decision was announced in a speech before Congress, where it go loud applause. Then on February 13, the House of Representatives passed the largest naval appropriations bill in American history, and it would pass by a factor of 15 votes for every one against. This bill was important given how critical the navy would be to any American war effort. Another issue for the United States, something that the naval bill would help with as well in the future, was the fact that ships were already clogging the east coast ports, refusing to go to sea due to the U-Boat threat. On the eastern seaboard warehouses and docks were packed full of good that would have been on their way to Europe except for the fact that they were waiting on ships to take them. This slow build of tension would continue until April and the United States navy would help to ease U-Boat fears for these ships. Even before the end of February it appeared that the President had made up his mind for war. He would write about this privately, but he would wait for American public opinion to coalesce around the idea before moving forward. Speaking of public opinion, I touched on it last time, but let's talk about it some more. Those who listened to the special episode I released with a recording of the speech I gave at a local Memorial Day event might remember that I talked a bit about public opinion and how mixed it was. Essentially everywhere outside of the northeast support for the war, especially among the Irish, German, and Jewish immigrants was almost non-existent. Even those who were not actively against American intervention saw very little reason for the country to get involved with the war. In their minds, whatever benefits for American intervention were already being experienced, with the economy already booming due to British money flowing in for orders for all kinds of goods. These viewpoints were not well covered at the time due to two reasons. The first was that many people just did not care that much, and this meant that nobody was talking about them or with them on the topic of the war. The second was that, even for the people who actively did not want to join the war, their vewpoints were suppressed both by those inside the government and the newspapers. At this point in history newspapers held a lot of sway over public opinion because they were one of the only ways for ideas to be shared. Many within the government therefore discouraged newspapers from sharing isolationist viewpoints, a practice that would grow after the declaration of war. Wilson still held the ability to choose whether or not to enter the war, and with public opinion mixed there was little chance he would be swayed to action by a public outcry. He had however painted himself into a corner with the U-Boat crisis, in his response to the German U-Boat campaign he had painted it as a crime against humanity perpetuated by the Germans. This left him no wiggle room when it came to how to respond to further attacks. There was also the issue of Wilson wanting to be the one to lead the world to peace, and for an explanation of how this effected things I will once again turn to G.J. Meyer from The World Remade "The most satisfactory answer is that, his efforts to end the war through mediation having been rejected by both sides, he feared that the United States, and he as president, would be left with no major part to play in the postwar settlement. The only way to change that was to earn a seat at the negotiating table, and by March 1917 the only way to do that was to enter the war. 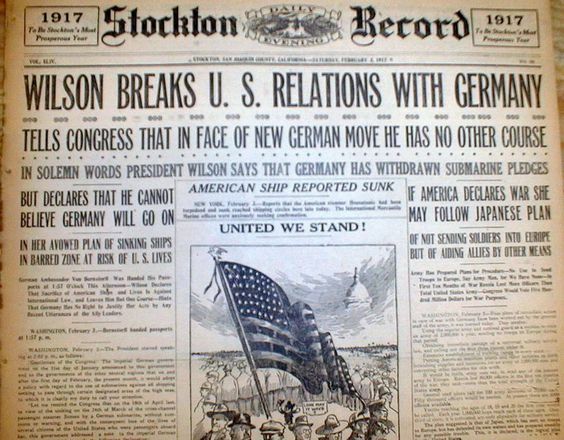 If the United States not only went to war but became the nation that broke the stalemate, that made victory possible, Wilson might well find himself at the head of the table. It was not an ideal solution, but from his perspective it was infinitely preferable to being excluded. It would impose on him the responsibility—in no way unwelcome—to stop the Allies from imposing a kind of peace that could never be more than unstable and short-lived. This was a quintessentially Wilsonian aspiration, at once noble and egotistical. It accorded perfectly with his sense of his own great destiny." Whatever the precise reasoning or thought process for Wilson the end result would be a speech before Congress on April 2. He summoned Congress on that day to hear "a communication concerning grave matters of national policy." when he arrived at 8:35 many stood and cheered with no doubt in their mind about what was about to be said. During his speech he called upon Congress to approve a declaration of war. He would use a phrase that would shape the next century of American foreign policy, that America had to enter the war because "the world must be made safe for democracy." He would then say "The day has come when America is privileged to spend her blood and her might for the principles that gave her birth. God helping her, she can do no other." These are phrases that would be remembered from his speech, but there are some other areas of his speech that are often forgotten that I for one find a fair bit more troubling. Part of this was because of what would happen during the next year of a half of war, and partially due to how they have affected the country for the last 100 years. He would say "The thing I shall count upon, the thing without which neither counsel nor action will avail, is the unity of America—an America united in feeling, in purpose, and in its vision of duty, of opportunity and of service…beware that no faction or disloyal intrigue break the harmony or embarrass the spirit of our people." A precedent was about to be set, that in times of war free speech in America, instead of being a right, would be removed in the name of unity and national purpose. Wilson and Congress would soon make this concept not just some idea in a speech, but a very real and very established fact. Almost as soon as Wilson was done with his speech the conversations about the possible declaration began in congress. The first, and most important, piece of legislation to discuss was the actual declaration of war. Discussion on the bill was mostly academic since it was almost guaranteed passage, but it would just be the beginning. There were a pile of other bills in queue behind it, like one from the Justice Department that would give the president far-reaching powers to censor the press and give control of the mail over to the government or the plethora of funding and appropriation bills that were necessary to pay for the war. On Tuesday April 3, Congress formally reassembled and got to work. There would have been a danger of a filibuster in the Senate, there were Senators who might have attempted such an act, but just a month earlier the Senate had introduced a new feature. This was cloture, a procedure whereby three-fifths of the Senate could agree to stop debate on any measure at any time, effectively removing the power of a small group of Senators to filibuster indefinitely. Therefore, since it was almost guaranteed to be instantly voted down, a filibuster was not attempted. Once debate on the measure began there was a long series of speeches by Senators. Some just wanted to be on the record as supporting its passage, others were strongly urging against it. Senator Stone from my home state of Missouri would say that it would be "the greatest blunder in history." One item of note is that the Zimmermann Telegram played almost no role in these speeches and the debate in Congress, at least on an official level it was already mostly forgotten. The speeches would go on for almost 6 hours. One speech of note against the declaration came from Senator Norris of Nebraska who made the claim that all those who supported the war were only doing so because they were in the pocket of Big Money. All of these speeches were a pre-show, a pre-cursor to the main event, and that was the speech of Senator La Follette of Wisconsin. He was the leader of the pro-isolationist members of the Senate, and his speech would go on for 4 hours. During this speech he would go over every single reason that the President had given for going to war, and he would answer each of them at great length. He would try to use evidence and reason instead of emotion to answer the calls for war. In his speech he would raise many very important points, many of which we have already discussed here on the podcast. Here are a few excerpts. "The failure to treat the belligerent nations of Europe alike, the failure to reject the unlawful ‘war zones’ of both Germany and Great Britain, is wholly accountable for our present dilemma. we have helped to drive Germany into a corner, her back to the wall to fight with what weapons she can lay her hands on to prevent the starving of her women and children, her old men and babes." When discussing the call to make the world safe for democracy La Follette would have some questions "The president was also wrong to call the war a conflict of democracy against autocracy. Was Great Britain a champion of democracy in Ireland? In Egypt? In India? To what extent could Britain herself, with her king and House of Lords and severely limited franchise, claim to be a democracy" When his speech ended La Follette sat down, reportedly with tears on his cheeks. When the speech ended Progressive leader Amos Pinchot would tell a journalist, Gilson Gardner "That is the greatest speech either of us will ever hear. It will not be answered because it is unanswerable." Over the next 2 hours more speeches would follow, but instead of answering the questions and concerns that La Follette had voiced, they just tried to discredit him as being un-American and un-Patriotic. These are easy accusations to make when someone speaks out against something that is seen as Patriotic and it would not be the last time that accusations of people being un-Patriotic would be thrown around the United States during the war. The final speeches were over just before 11PM and the voting began in the Senate. It would pass 82 to 6. In the House of Representatives the debate would continue until 3AM on the 6th of April even though the result was a foregone conclusion. When the votes were counted it was 373 in favor of to 50 against. While this seems like a landslide, for the next century no other United States military engagement would have as many dissenting voices in Congress as World War 1, it would not be until 2002 and the war in Iraq that this streak would be broken. At mid-day on April 6th, the President would sign the resolution, and the United States was at war. While the debate and voting was happening in Congress the Executive Branch had not been idle and the President had signed a resolution, one that was the tip of the iceberg which was to come. In the executive order the White House directed the United States Civil Services, which administered thousands of federal jobs, to remove any employee if there were grounds for believing that the employee should have any sympathies with the enemy or if the employee spoke out about the war in any negative way. These removals could be done without any other formalities and the official reason could be kept confidential. This order was both vague and incredibly powerful. Essentially the administration of Federal employees could removal anybody for almost anything that was said other than full-throated support for the war and in reality, due to the confidentiality of the reason for dismissal, it could be for just about anything as long as they claimed it was for patriotic reasons. With this resolution the United Sates government had brought a sled, and had just jumped aboard it on the slippery slope. With the United States entry into the war nobody on earth was probably happier than the British government. Over the course of the first 3 years of the war the British grew almost entirely dependent on the United States to keep both their society and their way effort moving forward. A large percentage of the guns, metals, shells, explosives, oil, meat, grain, and cotton used by the British were all being imported from America. In November 1916 of the 5 million pounds the British were spending every single day on the war a full 2 million of that was going to the United States in one way or another. By early 1917, the once seemingly limitless treasury of Britain was running dry. On April 2nd, the day of Wilson's speech, it was estimated that the British had only enough money for 3 weeks of expenditures abroad. With the declaration of war, all of these issues went away. Soon after entering the war Congress approved a 5 billion dollar bond issue. This was just the first of many appropriations bills, and for the moment Congress was eager to rubber stamp anything that was put in front of them when it came to paying for the war. In 1917 5 billion was a staggering sum, and 3 billion of it would be directly lent to the British and French which resolved any money problems for the British for the duration of the war. With the Americans now in the war there were some concerns among their allies that all of the best goods and services, which the Entente had been paying for before 1917 would not be redirected to the American war effort. To try and hed this off there was an Inter-Allied Council for War Purchases and Finance setup in Paris to try and coordinate and prioritize purchasing among the Allies. Then there was also the Allied Purchasing Commission which sought to keep prices under control and demand grew. While this solved many problems it also represented a seismic shift in world power. With the British now wholly dependent on the United States, the Empire on which the sun never set would lose its position as the financial center of the world and the focus of money power in the world shifted away from London and to New York City. The British and French wasted no time in sending both political and military liaisons to the United States so that the countries could start working together in their new wartime endeavor. Almost immediately they began unveiling how bad the situation was, and even if the Americans knew part of the story they did not have any idea how many lies were contained in Entente propaganda. Instead of winning the war the Entente were closer to losing it than ever before and it was only through the Americans that they hoped to stave off defeat. Therefore they began asking for massive amounts of American money, supplies, and troops. This last was very urgent, and they had a wonderful idea on how to expedite the process. Instead of the Americans forming their own army, which would require so much administrative and logistical work, they could instead just giver the British and French the troops. On, and they didn't have to worry about officers either, just normal enlisted men is that what would be required. The British and French would then make sure they were used properly. Just think about how many problems this would have solved for the Americans, boy those British and French were being so nice. The British wanted half a million of these men immediately for their armies. From the American perspective this was, of course, completely madness. The Americans would be sending their own army to Europe, let by Americans. But, about that army. The best way to describe the American army in 1917 is anemic, especially on European standards. In a huge difference from today, in 1914 the American people had a general distrust for their military. This meant that representatives of those people often did their best to try and keep the army as small and underfunded as possible. This meant that there were laws around the fact that the General Staff could not be more than 55 officers, and only 29 of those could be based in Washington DC. They also kept the army very small, with it having a grand total of 130,000 men in 1916, all of whom were spread around the country in a large number of smaller postings. All of this was done because many people were concerned about a large central government having a large powerful army under its control. In June 1916 the National Defense Act went through Congress to increase the number of men up to 175,000 and to increase the National Guard to 450,000, again a pittance on the World War 1 scale, and even these numbers would not be reached for 5 years. This increase was not actually related to the possibility of entering the war but instead due to the Pancho Villa raid that we discussed last episode. When war was declared it was decided that a division should be sent to Europe as soon as possible, both for propaganda reasons and to prepare the way for many more troops in the future. There was just one small little problem, the American army did not contain a division. This was due to the fact that no single concentration of troops in the country was large enough to require the creation of the division. So step one for the American Army in World War 1 was to create a division, which as a person who grew up in a post-Cold War world, is a little mind-boggling. The number of men in the army would obviously not be sufficient for the war at hand. The Europeans understood the amount of work that would go into building the army and therefore kept their expectations quite low. The British believed that the Americans would have just 150,000 men in France by the beginning of 1918 and then just 500,000 by the end of the year. This is part of why they pushed so strongly to just have the men sent to them to be integrated into their own units, it would make the American contribution impactful sooner. The government and military of the United States were thinking more short term though, and they were faced with a problem. Everybody knew they needed more men, probably a lot more, probably 3 million more. How were they supposed to get so many men into the military? The only possible answer seemed to be conscription. Shortly after war was declared Wilson announced that he wished to raise an army through conscription, but this was not as easy to make happen as you might think. Many recent immigrants to America associated conscription with their former homes, when they moved to the United States it was supposed to be different, they were supposed to be free. Even non-immigrants believed that if Americans began to use conscription it would bring and end to what made the country so special in the first place. For this reason it would take over a month for a bill to be introduced in Congress to approve the implementation of conscription and even when it was it would only pass the House of Representatives with 199 yes and 178 no votes, with 53 members abstaining. That is not exactly a ringing endorsement. In total 24 million men would be registered for the draft, all males between the ages of 21 and 30 and they had to register by June 5th 1917 at their local post officers, which in many smaller town was the only government building. More than 9 and a half million would register by this date and the first draft lottery would be held on July 20th. When they registered every man was given a number between 1 and 10,500 then once a specific number was called everybody with that numbers was immediately drafted into the military. The first number to be drawn was 258, with many more to follow. In total 687,000 draftees were ordered to report for duty on September 1st, but not everybody showed up. In total 65,000 men would apply for noncombatant status during the war, most of these were for religious exemptions, most of which were granted. A further 337,000 would refused to report for duty when drafted over the course of the war. But many more did report for duty, and now the Americans were finally building up an army, but now it was time to train them up and to decide what to do with them, topics we will cover next episode.